Sweet Sadie's Baking: Chocolate Bread....Better than Club Med's! 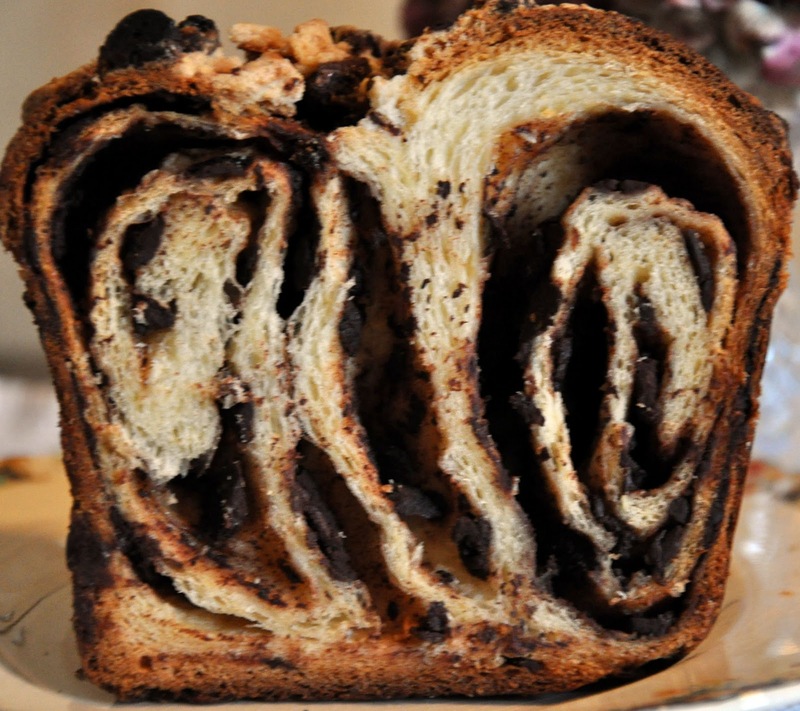 Chocolate Bread....Better than Club Med's! 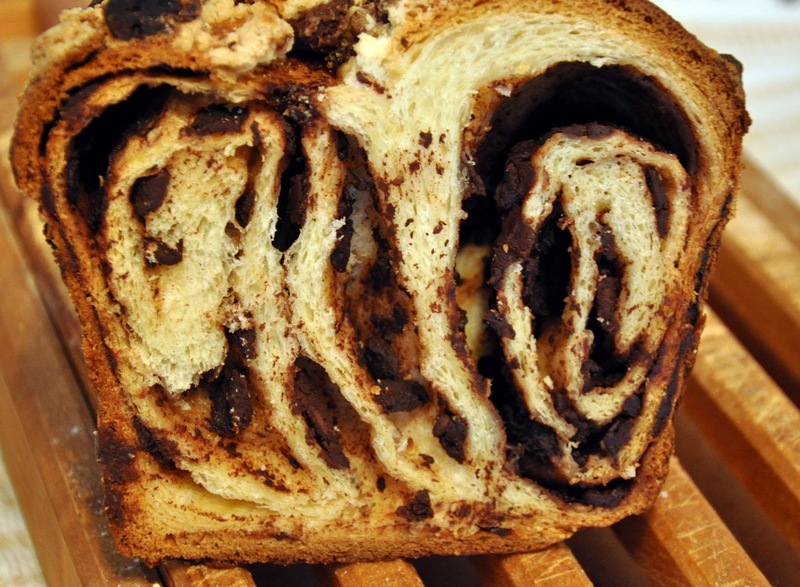 Many of you know that I have worked in the travel industry a gazillion years, and so many times I have heard people ask when they were chatting with someone who had gone to Club Med was "Wasn't the Chocolate Bread Amazing?" And everyone agreed. At one time I had the recipe but can't find it now.....Who cares? Move over Club Med...honestly I like this one better. My friend Ivonne, over at Cream Puffs in Venice, started "Magazine Mondays" back in 2007, and I have been meaning to participate, so here goes. It is very informal and it really is about trying those recipes in Magazines you have hanging around. Go check her out, she has a great Blog. 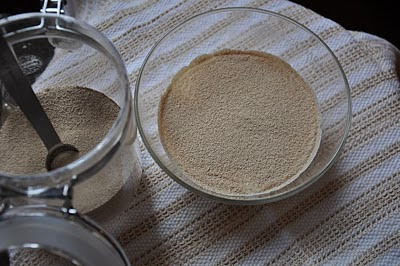 Sprinkle the yeast and a pinch of granulated sugar over the milk in a medium bowl and let it stand until foamy. 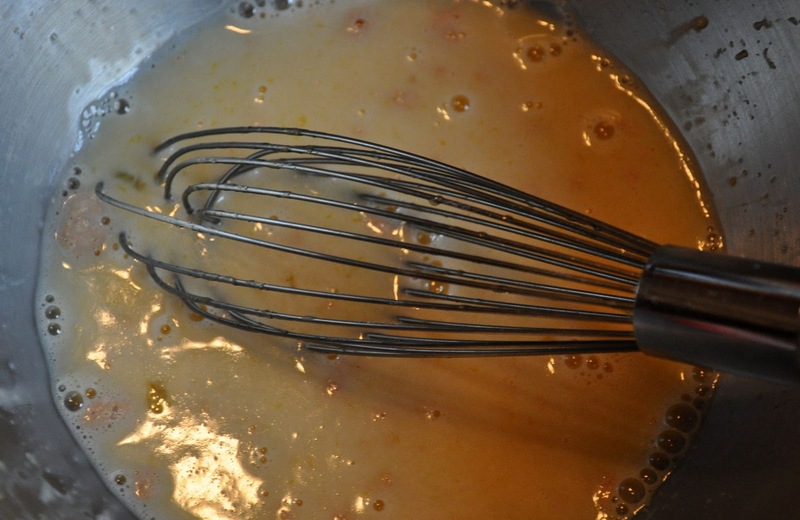 then add the egg/yeast mixture. Beat on low about 30 seconds. 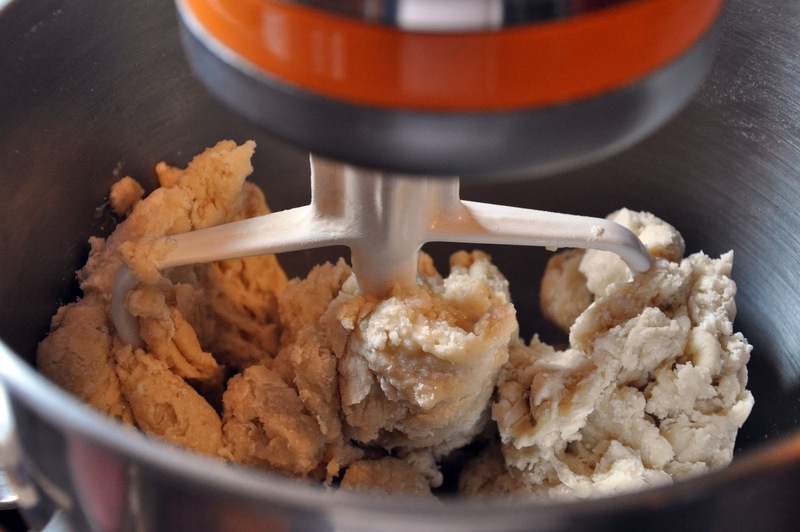 Switch to dough hook and add butter and beat until smooth, soft and slightly sticky. Butter a large bowl. 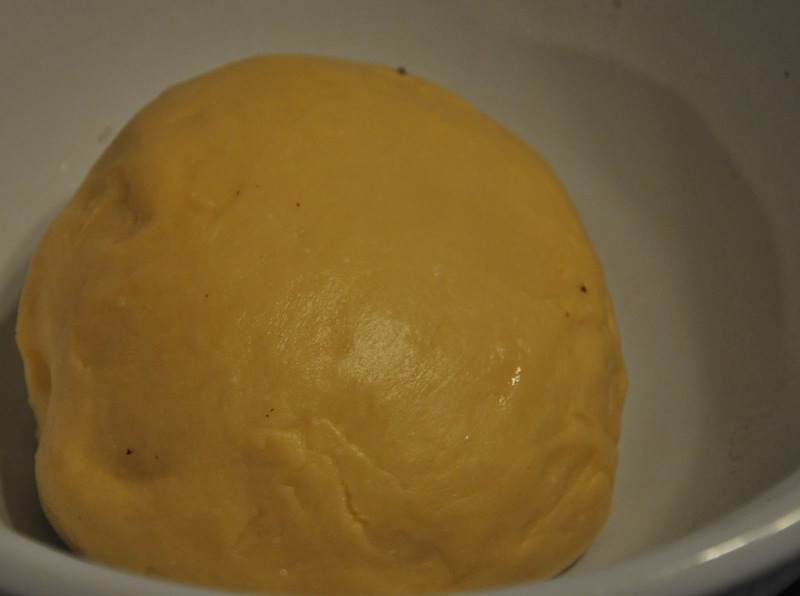 Turn out onto a floured surface and knead a little until smooth. Place in the bowl, turn to coat and cover with plastic wrap. Let stand in a warm place until doubled - about 1 to 1 1/2 hours. Now let's make the filling! 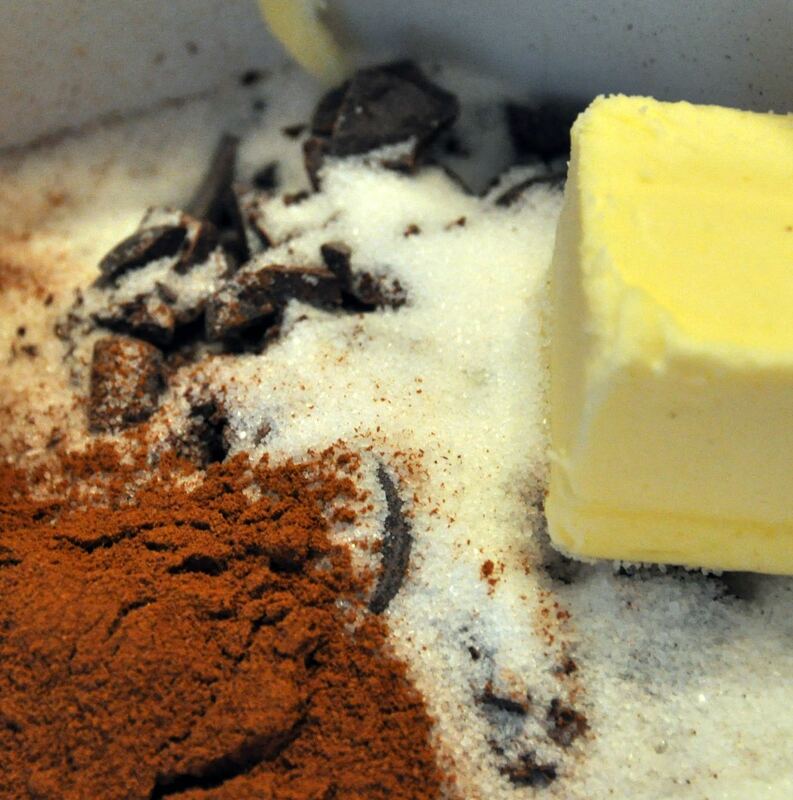 Combine chocolate, granulated sugar and cinnamon then cut in the butter with a pastry cutter or rub it in with your fingers...that's what I did! Punch down the dough then transfer it to a floured surface - let it stand for 5 mintes to relax. Roll it out to an 18-inch square (1/8 inch thick)- brush edges with egg wash. 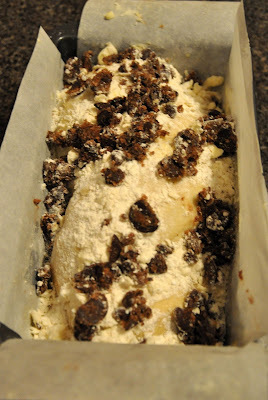 Spread the filling over the dough (reserve 1/2 cup) - leave a 1 inch border - and tightly roll like a jelly roll. Butter a 5x10 inch loaf pan and line with parchment, leaving 1inch overhangs, butter parchment and transfer dough to pan. Brush top with egg wash and sprinkle crumb topping and reserved 1/2 cup of filling over bread/cake. 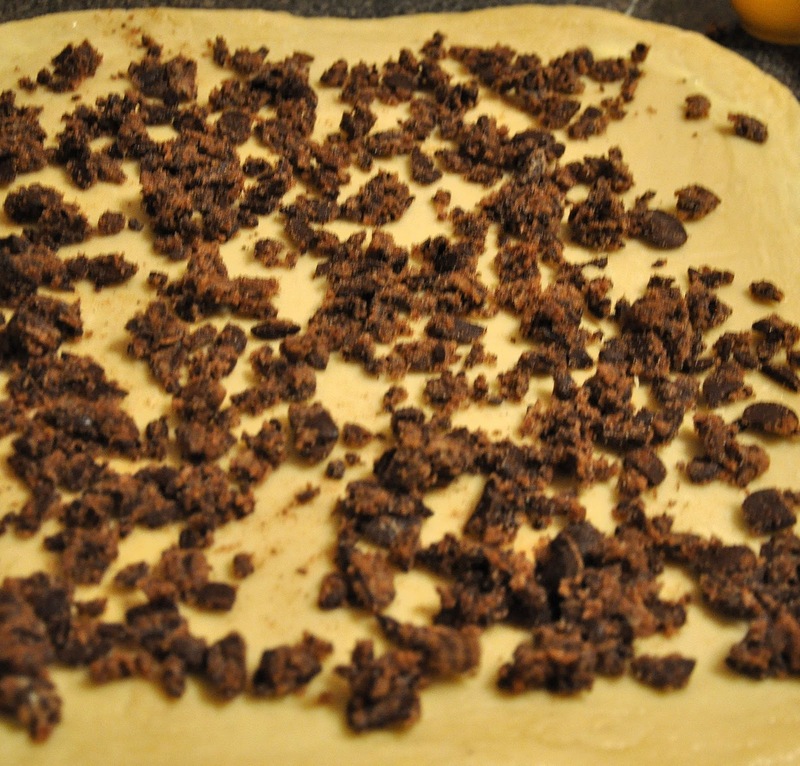 Drape a plastic wrap over dough/pan. Remove plastic wrap and bake, rotating half way through, until golden about 55 minutes. Reduce oven temperature to 325 degrees and bake until deep golden 15-20 minutes more. Have some foil to cover it if it gets too dark. Transfer to wire rack and let cool. The chunks of chocolate look insanely good (along with the rest of the loaf, of course :-). Oh, baby! I bookmarked this one as soon as I got the magazine and now I want to scramble to make it. It looks GLORIOUS!!! Oh Penny, this looks wonderful! I just saw this in the mag a few days ago! Yours looks much better. Fantastic blog, btw! Cheers. Whatever you call it...it looks delicious. This is great! Reminds me of the chocolate Babka I love so much. I will try to make one soon and thank you for passing on Sadie"s recipe! Thanks. 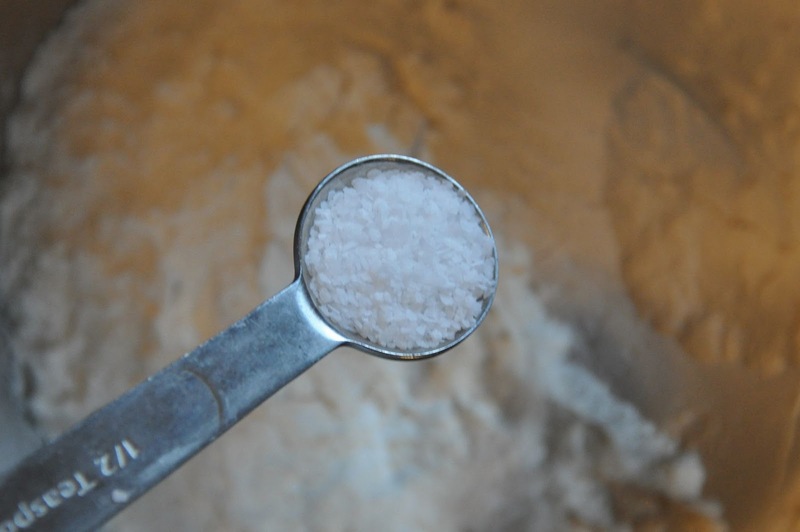 I used this recipe as a basis for my own recipe. I did pretty much the same, but made a bigger loaf. Rather than an egg and a yolk, I used three yolks. The only bittersweet I could find at Trader Joe's had almonds, so I did half bittersweet with almonds and the other half with a dark chocolate. 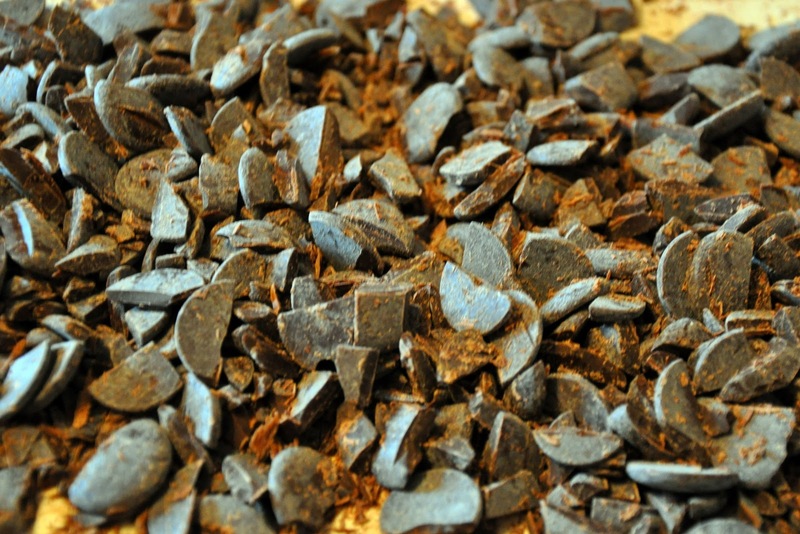 Also added a little dried coffee. 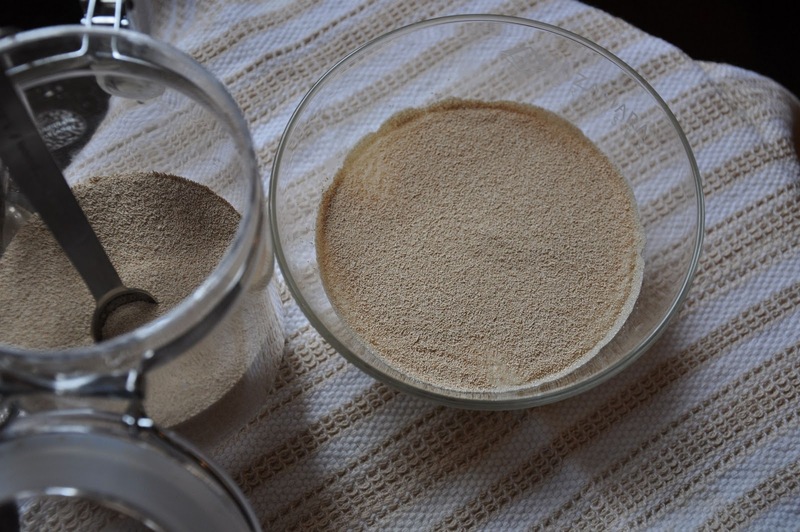 My flours included not only AP, but a little buckwheat and some ATTA (whole wheat). Added vanilla and orange flavoring to the dough. It seems that most recipies with chocolate wind up being a coffee cake rather than a bread, so it will be interesting to see how this turns out. 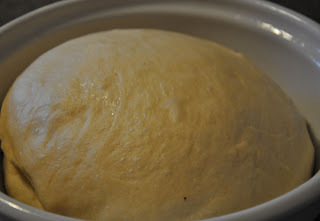 My bread is made with natural yeast, not commercial, so I will have to wait overnight before I can bake. Forgot to buy cream for the topping, so I will have to get by with milk instead. Mostly I put this comment to encourage people to actually make bread- not just comment on the pictures. Don't get too hung up on the exact recipe- just have fun.